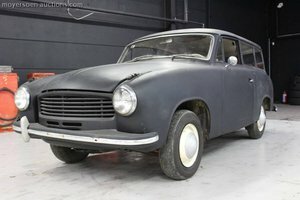 This rare restored Goggomobil TS from 1961 has been preserved in a very beautiful, original state. Equipped with the then optional electromagnetic pre-select gearbox. This dwarf car is equipped with the popular '' suicide doors ''. The body is sprayed in a beautiful blue paint which combines well with the white roof. The 14 hp two-stroke engine runs well and the pre-select gearbox also switches well. The sports coupe models (66,000) are a lot rarer than the sedan models (210,000) of which only a small number are left over. 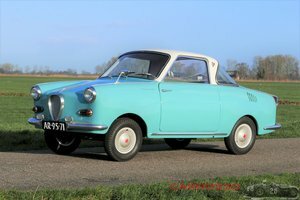 In 1966 the company was taken over by BMW, 3 years after the takeover the production of dwarf cars was stopped and they continued under the name '' Glas Isar '', after which they concentrated more on luxury and especially larger cars. This Goggomobil has documentation such as receipts, invoices, instruction booklet etc. Price: ? 12.850,- Euro. For more information or photos of this car, visit our website www.carrosso.eu or contact us by phone. At the moment we have about 100 classics and sports cars in our showroom. You are welcome to view it. For buying and selling or inconsigning sales of your oldtimer / classic you can also contact us.